If you’re one of the millions of Americans trying to take and keep the pounds off, let Fat Is Not Your Fate be your first step toward a fit and healthy future. 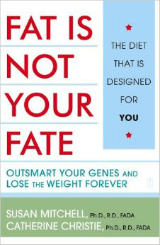 This book offers a ground-breaking, scientifically proven approach to weight loss — one that allows you to follow a personalized nutrition plan tailored to your own genetic blueprint. Take the Phenotype Quiz and learn how to manage your weight based on your individual gene type!